We are officially participating in The Dubai Shopping Festival with 30% Discount on all courses! We as a team have decided to be a part of Dubai’s amazing Shopping Festival and are giving all our customers the opportunity to come and learn with us and join one of our 13 Make Up Courses but with a massive discount of 30%. 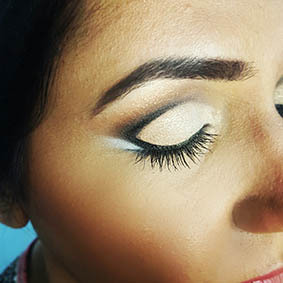 If you just want to learn the basics of make up application from the very beginning starting with the basics of foundation to smokey eye application, we have everything to cover every aspect of make up. we only use the best products too, Kryolan. Make sure you apply makeup on clean skin. This is VERY IMPORTANT. The makeup will look flawless and fresh on a clean and moisturized skin. For an even look use a cream foundation and apply it in layers. Make sure to correct the undertones with the right corrector colour, if the undertones are more into purple we have a warm type, correct it with yellow corrector but if its more bluish we have a cool undertone and will correct it with the peach corrector. For heavy contouring and highlighting use cream products because they are easy to blend. Always set your foundation with a translucent powder because it will give you a flawless matt look and will hold your makeup. Make sure that your eyebrows are plucked and shaped. For a natural but defined look use eye shadows to fill up your eyebrows. When working with cream textures on the face and eyes make sure that the foundation and corrector are perfectly blended no creases on the lid. Apply the base eye shadow evenly on the lid. Before starting with dark eye shadows apply translucent powder under the eyes to avoid smudges on the skin. When applying the eye shadows make sure that you are using the right brushes and try to get the perfect transition between the colours. For cleaning the small smudges around the eyes always use dry cotton buds never make them wet because you will ruin the makeup. Make sure that you are applying the mascara from the roots of the lashes to get the full volume effect. To make your lipstick lasting much longer apply foundation on the lips and set it with a translucent powder. Use lip liner to define and correct your lips. For the ultra gloss and shine apply micro pigments on the center of the lips. Tips and Tricks for Smokey Eye Look. Step 2- For a healthy glowing, dewy skin will use the Kryolan Vitacolor foundation and blend it with a sponge. Step 3- Our models undertones are warm to correct it will use a yellow corrector. Step 4- Contouring and highlighting with Kryolan Supracolors. Step 5- Set the foundation with white translucent powder. Step 6 Define and fill in the eyebrows with dark brown eye shadow. Step 7- Apply a base colour on the entire eyelid. Come on ladies there are a couple of places left on this course which starts tomorrow!! 30% discount so NOT AED2500 –but now ONLY AED1750. Come and learn how to apply your own make up and look the like a professional artist creates your look everyday and dazzle your friends. 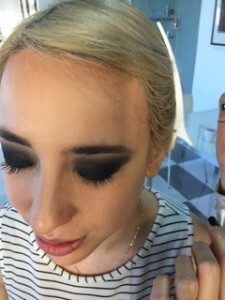 Smokey eyes can be enhanced many different ways. All different colours, shapes and enhancements. We will teach you the simplicity to design your look from soft and subtle to “Meow Wow” dramatic. 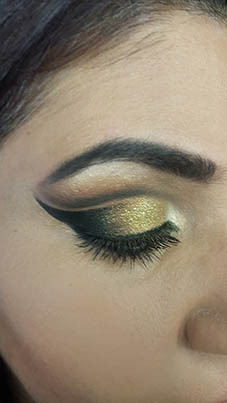 Images from our student doing Smokey Eye off the Gold Make Up Course. Our wonderful model, Amy Jordan having her dramatic smokey eye make up done by our student on The Gold Make Up Course. Sum Toe started only a few days ago an has already got to grips with the Kryolan products. In our opinion and after trailing many make up brands we decided on Kryolan. It is the best product for coverage, blending and for ease of use once you understand the texture. As always our Lipstick Make Up team is creating and making the models look beautiful on the catwalk. 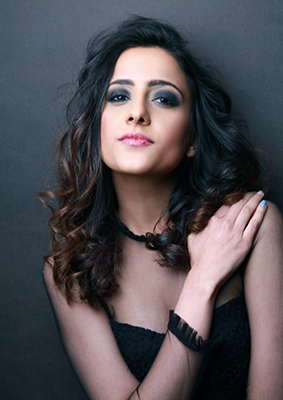 Fresh, professional and stylish make up and hair. Our Creative team are just amazing. 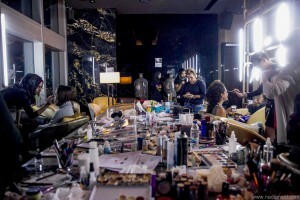 Livia the Master Make Up Teacher, trains then students to become the best Make Up Artists in Dubai. 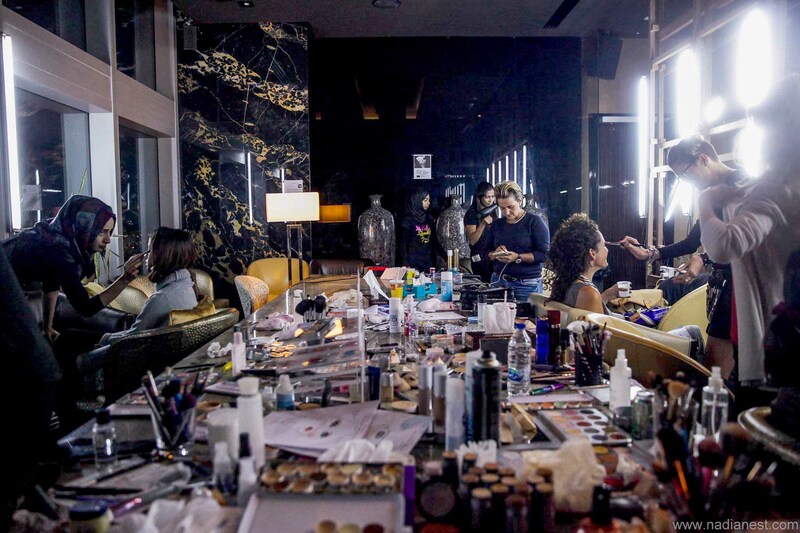 Our Make Up Master andLipstick Make Up Team hard at work , behind the scenes at The Fashion Show held at The Conrad Hotel, Dubai. 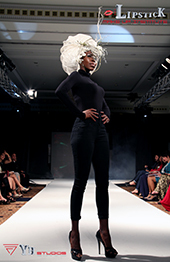 The models looked amazing on the catwalk with our teams skills applying the best make up from the Lipstick Make Up Institute using Kryolan Products.